An easy mowing head to load and renew as it wears. The AutoCut C 26-2 mowing head boasts a new design intended to make trimming jobs as quick and easy to complete as possible. 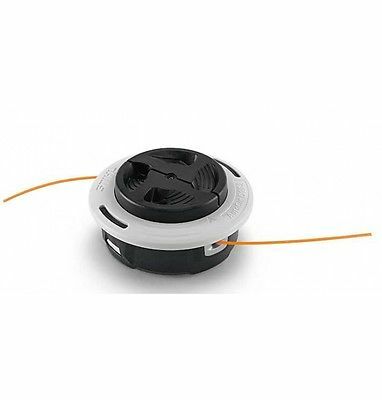 This is a two-line mowing head, with an easy loading mechanism. FS 55, FS 56, FS 70, FS 85, FS 87, FS 90, FS 94, FS 100, FS 120, FS 130, FS 240, FS 250, FS 260R, FS 460R, FR 130, FR 410, FR 460, FS-KM & FSA 90. FS55, FS56, FS70, FS85, FS87, FS90, FS94, FS100, FS120, FS130, FS240, FS250, FS260R, FS460R, FR130, FR410, FR460, FS-KM & FSA90. 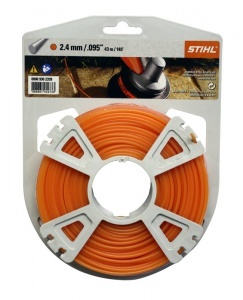 STIHL's round mowing lines use a special spiral groove in the surface to create an even flow of air. This is the 2.4mm x 14.6m size. 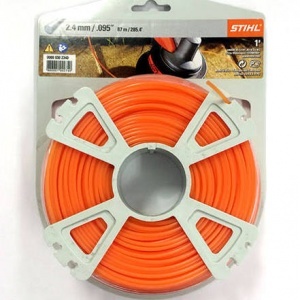 A 43 metre roll of 2.4 mm diameter round mowing line, this is ideal as a replacement for worn line and is a genuine STIHL part. Made of a long-lasting, flexible material. 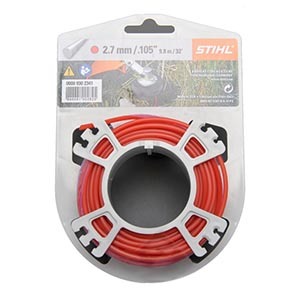 Genuine STIHL mowing line that's 2.4 mm in diameter and in a 14.6 metre long roll, this round profile line is made from wear-resistant, long-lasting material. 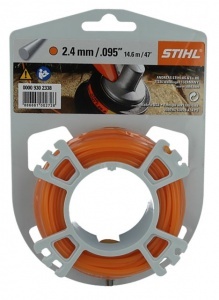 With this 86 metre reel of 2.7 mm line you can easily replace the existing line on your STIHL mowing heads. It is made from flexible, long-lasting and wear-resistant material. 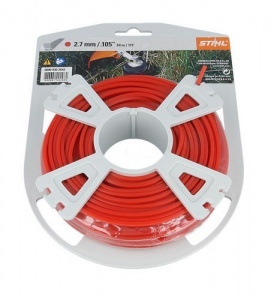 Ideal for replacing worn line on your existing STIHL trimmer, this 68 metre roll of 2.7 mm square mowing line is a genuine STIHL product.